Being born and growing up in a small village in Germany with loving open-minded parents. Since childhood feeling a strong longing and searching for understanding the mystery of life, first in the context of church, then with 16years connecting intensely with Zen- meditation ( through Pater Lassalle, who coming back from being a missionary in Japan introducing Zen in this time in Europe), and the teachings of the Rosicrucian. Studying Psychology and Comparative Religion (with a burning focus on the living masters of our time, mainly from Zen, Sufi and Hindus traditions) in the university in Bonn, at the same time being strongly influenced by the new therapy techniques coming to Europe ( like Bioenergetics with Jan Velzebour and Alexander Lowen, Gestalt Training , Autogenes Training with Dr. Lindeman, Group dynamics with Prof. Däumling ). After completing university she felt an intense call to meet Osho (at that time called Bhagwan Rajneesh) in Puna , India in 1977, were she then stayed 4 years living and working at the Multiversity of the Ashram( which was on of the greatest places for transformation in the world at that time, offering all kinds of modern therapy as well as meditation and all this, in the presence of a living Master) .In this time she also learned Rebirthing, breath-therapy, which became one of her strongest tools of work, gaining deep insight and much experience in working with 5 sessions daily or in groups for all this years at the Multiversity in Puna and later in Oregon, USA. 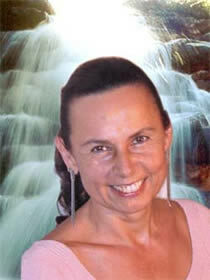 In this years of practical work and the integration of deep understanding of the works and interrelatedness of mind, body and emotion are the roots of the Breath-therapy training ,she created and delivered since 1982 in Germany, Italy and from 1986 in Brazil sharing with thousands of people this wonderful tool. Sri Nisargadatta Maharaj and Ramesh Balsekar, Zen-Master Seung Sahn Dae Soen Sa Nim and Ji Kwang Dae Poep Sa Nim, Gangaji and Eli Jaxon Bear, Leslie Temple-Thurston, Beth Hin. In 1982 she also co-founded a publishing company in Germany (Context-Verlag, today called Kamphausen Verlag) to support the knowledge of Advaita literature and new age literature in the German speaking countries). Through being invited by Osho in 1989 to introduce the traditional 3 month Buddhist meditation retreat in the school of centering, multiversity, in Puna, she got much more involved with meditation in the coming years. Also in 1991 happened the meeting with theAvatar-system from Harry Palmer, A modern 7-9day process to shift from mind to essence, which she touched as licensed Star-master and Wizard to hundreds of students all over Brazil. The last years she is mainly working in Brazil ,and since leaving the Breath- Therapy Trainings in the hands of experienced former students , she is sharing her work in a concentrated training called “Transformation course “, as well as the Chakra-training and the Kyol Che-meditation-retreat. From time to time there are “Essence Journeys” offered to special wonderful places of our planet. “Definitely I feel very blessed in my life to have met so many realized people to support this journey home to essence and feeling blessed, that I had so many opportunities to share my insights.I am grateful that I could get to know so many countries and cultures, so many wonderful authentic people, imbibe ancient and modern wisdoms and living truth. I am deeply thankful to Osho, who gave me this name Samvara (the mystic union of all form), as a constant single pointed reminder of true reality.